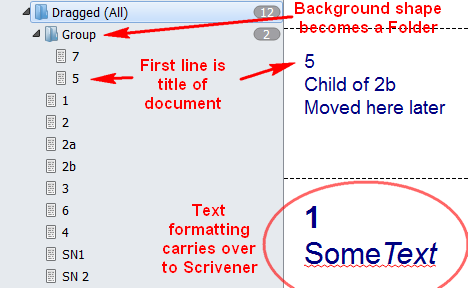 Scrivener is a very useful tool for writing, organising and and revising text. It allows for hierarchy and structure without forcing the user into only one method of creating that. 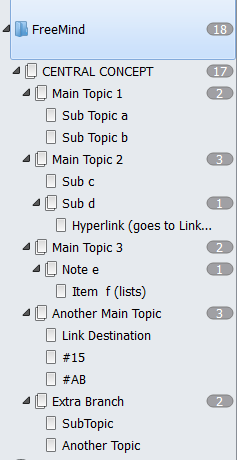 In addition to the Outliner View, which gives the user a method of analysing their documents in a comprehensive manner, the Binder also acts as a form of “Outliner List” that you might be used to seeing in programs like word (though Scrivener’s Binder does more). That is, you can clearly see the different documents by their title, and how they organised in relation to folders/groups, and other documents. You can move and manipulate them as you need. There are other ways of organising concepts though, using Mind Maps, and these can be used in various ways with Scrivener. Mind Maps were popularised by Tony Buzan and it’s easy enough to draw them manually instead of using a computer program or app. 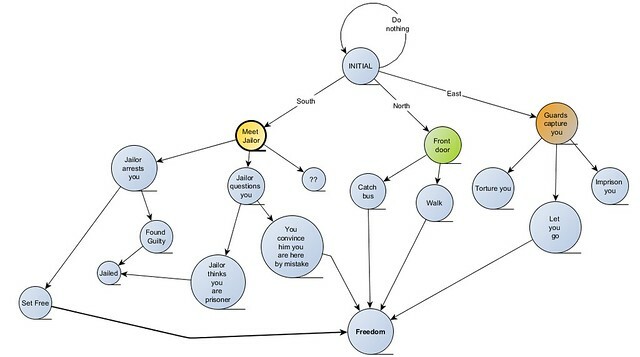 A typical use for a mind map might exploring an idea on the spur of the moment, making connections between similar or related ideas, and brainstorming new ones. You could just create a number of blank documents are in Scrivener and rearrange them in the Binder to reflect the structure, but what if you’re not using Scrivener at the time? There are many apps for iPhone, iPad, and Android phones available which use OPML to store data, and a number of those are either mind mappers, or outliners. Either way it means you can play with an idea on the run, and then the import an OPML file from that app into Scrivener when you get to back your desktop. As you can see it has a central concept, and then branches into several main topics, with a variety of sub topics and notes. These are called nodes and some nodes are connected by a curvy arrowed line indicating that they’re related somehow. A typical mind mapping program will allow you edit almost everything on the map on the fly by using a mouse or other method. You should be able to add, move and delete nodes, name and rename them, add notes (formatted text associated with the node) and other formatting to them. Also ideally a mind mapprogram will also allow you to import information to create the map, and export it later in a variety of formats. The simplest way of getting a Mind Map into Scrivener is making an image of it and importing/copying that like any other image. This can be done using EDIT > INSERT > IMAGE FROM FILE (or equivalent keyboard shortcut) within the Editor. You can use FILE > IMPORT > FILES to add the image to the binder directly. Most mind map programs have the ability to save/export an image based on the map (size will vary). If it doesn’t you should be able to zoom in and out and take a screen shot using an appropriate utility, and then save/edit/import that. And that might be all you need, a visual reminder of a set of ideas. You may not need to import any more detail than that. 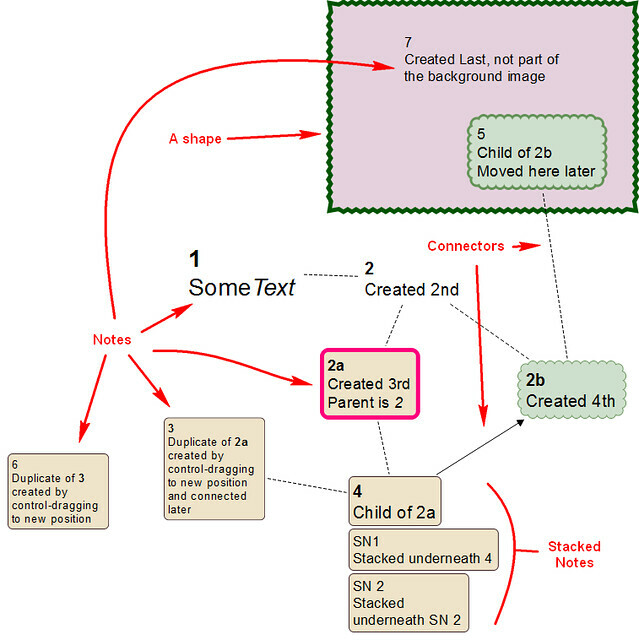 Graphs might be handy for any number of ideas: However, if you do want to import a mind map or outline into Scrivener as a series of structured documents, you have two choices: .mm and .opml formats. Clouds, text, links (known as “edges”) bubbles and graphic links can all be formatted in various ways. 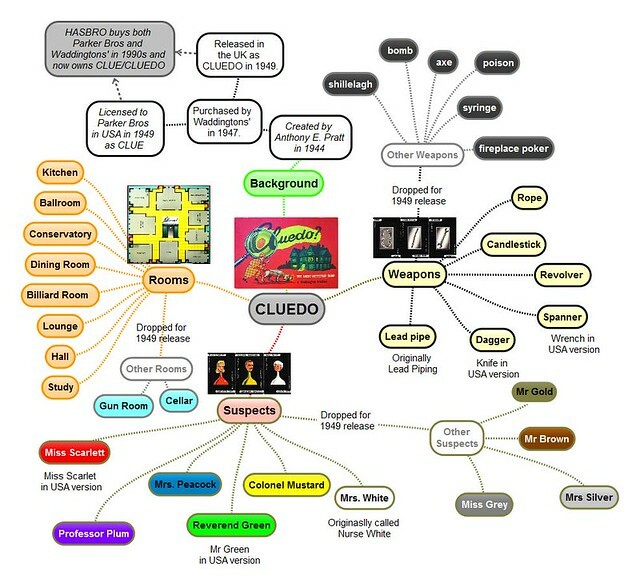 Examples of Mind Map feature. Binder exported back again to a Mind Map. As you can see the structure and notes are there, but everything else is gone. Also, not how the filename used - FreePlane MM Export - has become the central node! While this may seem odd, it’s actually done by Scrivener and means you can export several groups of documents with no central document. Also the “untitled” node branch was actually the one with the Image inserted. The title for that was “faked” in FreeMind because the image overwrote the title, so an “extended node edit was used to fix that (nothing you need know unless you use FreeMind). Titles onlyNo notes are imported. Only the title of each document is exported. 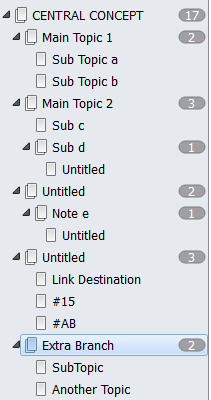 Titles and NotesDocument Notes are exported notes. This format is mainly used to import from and export to Outlining Programs. OPML stands for “Outline Processor Markup Language” and is an XML file format for describing outlines. The OPML file format is supported by a number outlining packages, and also by some mind-mapping programs. Mac or Windows desktop applications that support OPML are less common than apps on smart phones that do, but they do include InfoCube, Notecase Pro, SimpleMind, and Aeon Timeline. In any case exactly the same Import and Export options are used with this format. There are slight differences though in what you get. The following is the same structure as shown above in the .mm import, but this has first been imported by SimpleMind and then exported as a OPML file. Certain missing titles are there, whereas they were listed as “untitled” in when imported using .mm format. There’s also an addition document at the top “FreeMind” which is the name of the original mind map, not the exported file name.. There may be other differences as well, especially if you’re using the Main Text (with Synopsis) option, but that will depend on the program or app that exported the file. Likewise, your mileage might vary when exporting from Scrivener as well. SimpleMind for example will import any notes from Scrivener, but as all notes in SimpleMind are plain text, the formatting gets lost. 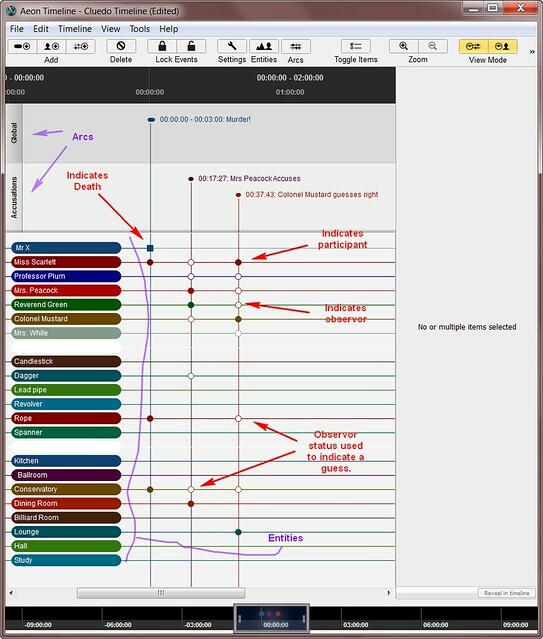 Aeon Timeline showing entities and one event. 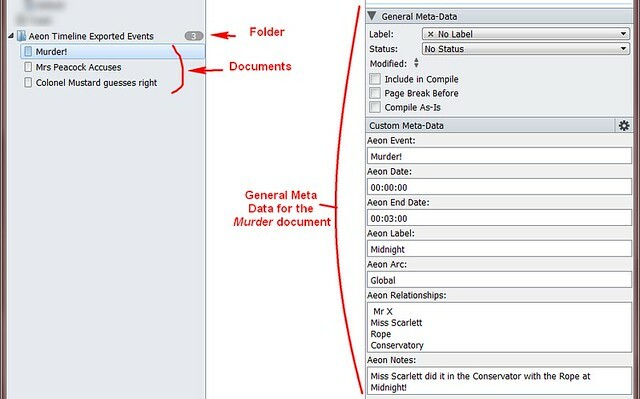 Scrivener creates a new folder called Aeon Timeline Exported Events folder, and underneath that creates one document for each event. As you can see there’s a lot of data in the General Meta-Data sub-panel. Notice how the entities involved in the event are listed under Aeon Relationships. The Aeon Notes includes a comment I typed into Aeon directly. Now this great because you can search for Custom Meta Data in Scrivener, making it easy say, to find all the scenes in the Conservatory, and perhaps add those to a collection. You can still search for that, but with different options than shown before. Depending on which part you selected when importing. So why would you import an OPML file instead of syncing with an Aeon Timeline? Well, perhaps you don’t have a copy of Aeon and someone else sent you the OPML file of timeline they’ve created, perhaps as part of a collaboration. Or maybe you have Scrivener and Aeon, but for some reason on different computers (for whatever reason). Also note that while Aeon exports to OPML format, it doesn’t import it. Maybe it’s better to drag! 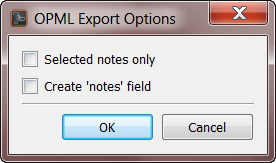 Ticking the Selected Notes only box means that you’re only exporting what you’ve selected,. 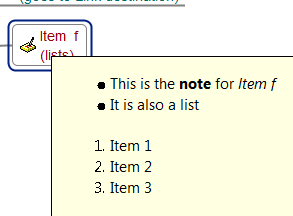 If you don’t select the Create ‘notes’ field, none of the text in the notes will be copied at all. While it might seem that exporting notes from Scapple to Scrivener (as distinct from dragging them) might be a backward step, clearly the OPML file can be used by other programs, perhaps a mind mapper or outliner on a phone. Once again your mileage will vary! Enter “OPML” in the search field and select the platform (Android, iPhone, etc). Have fond memories of this. Have tried out Aeon Timeline.